Since harsh winter weather hit the encampments where thousands of people protesting the Dakota Access Pipeline have been living near Cannon Ball, North Dakota, on Monday, the nearby Prairie Knights Casino & Resort has been operating as a makeshift community of protesters taking shelter from the cold. The hotel, which some have referred to as “Casino Camp,” has been overflowing with people since snow and wind collapsed tents Monday and forced some protesters to seek shelter in the middle of the night in larger camp structures. On Monday, Standing Rock Sioux Chairman David Archambault II made a statement that it was time for those supporters to leave the camps and go home; on Tuesday and Wednesday, thousands of campers left. The Crow Creek Sioux Nation Tribal Council put out a letter this week to say their participants in the protest will be leaving, with their “heads held high.” “It is winter now and the weather is brutal. I believe Mother Earth is telling us it is ok now, at least for a while,” the statement read. Most protesters see Sunday's Army Corps decision to deny a permit for the pipeline to go under Lake Oahe as a victory but only the first step in an ongoing battle. Andy Billotti, of Middletown, Maryland, checks email at the Prairie Knights casino, which has been heavily used by protesters from the nearby Oceti Sakowin camp as an emergency shelter as snow, high winds, and below freezing temperatures buffeted the region. For days people have been milling in the Prairie Knights lobby, exchanging phone numbers, looking for rides, playing guitars, obsessively checking the news on their phones and speculating on what might happen next with the pipeline. The pavilion inside Prairie Knights has become a hub for meetings and ceremonies related to the protests. On Monday, a “forgiveness ceremony” took place, in which veterans who had come to support the camps asked for forgiveness from tribal elders for the atrocities committed by the U.S. military in the past. 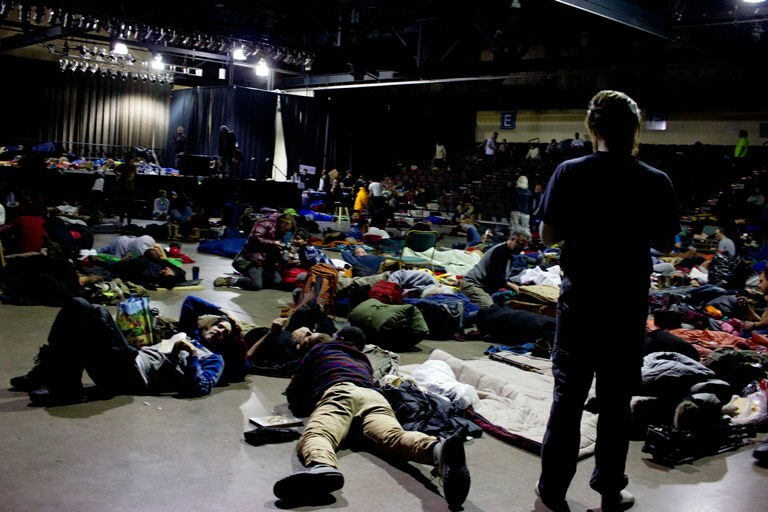 On Monday and Tuesday night, many protesters rolled out their sleeping bags in halls between guest rooms and in the pavilion because all the guest rooms were full. To meet the need for cleaning rooms, veterans volunteered to help the hotel staff early this week, apparently because bad weather kept some employees from making it to work. For days, Oceti Sakowin Camp, one of the three camps near the disputed pipeline, has been reassembling itself, at least temporarily, in the hotel. The “health and wellness” tent that provided things like acupuncture, herbal medicines and counseling had moved from camp to a guest room on the third floor. I ran into one of the tent’s leaders, in the elevator: He said they were still providing counseling and other services that were available at camp, and that they would stay at Prairie Knights as long as needed. Wednesday I met Michael, 28, and Christian, 34, veterans who took a bus here from California to support the movement, in one of the hotel lobbies where people have been coordinating rides for days. From a hotel room Wednesday night, they were strategizing how to improve the toilet situation on the prairie, since the Port-a-potties were full and frozen. They had access to money recently donated from private individuals to support the camps and planned to use some of it on composting toilets and winterizing other camp infrastructure. 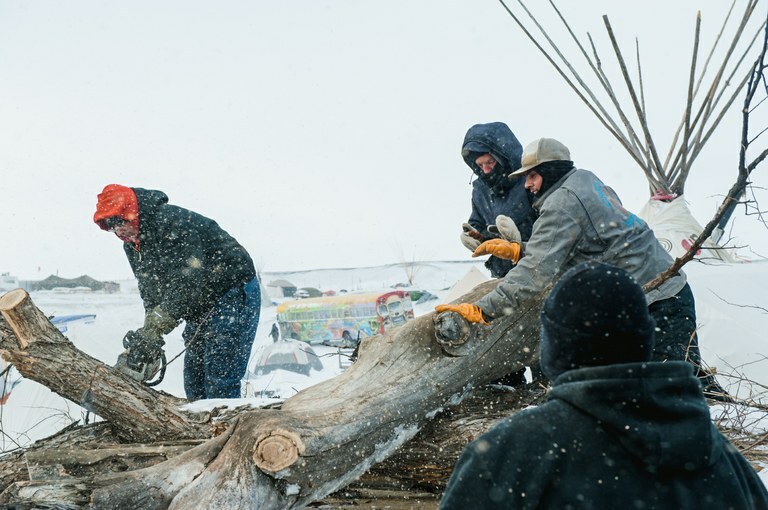 Residents of Eagle Butte, on the Cheyenne River Reservation in South Dakota, unload donated firewood into a campsite at the Oceti Sakowin camp in Cannon Ball, North Dakota on Dec. 7, 2016. Matson worked as a medic at Oceti Sakowin Camp for several days. On Monday, when veterans marched to the barricade between the protesters and Energy Transfer Partners' construction site in driving snow as a sign of protest against the pipeline, Matson pulled people from the march who had signs of hypothermia and brought them to the medic tent. Still, the employee, who asked not to be named, said that there are several regular clients to the casino who have criticized the establishment for being so accommodating of the pipeline protesters. She said at least one “VIP” customer who used to come multiple times a week and spend thousands of dollars in the casino told them they might not come back, after seeing how Prairie Knights is welcoming in the protesters with such open arms. It’s unclear whether the pipeline company will in fact have to consider alternate routes as the Army Corps suggested in its Dec. 4 statement. Energy Transfer Partners has said that they still intend to move forward with the project. A hearing about the issue is slated for Dec. 9 in Washington, D.C.
On Wednesday afternoon, I returned to Oceti Sakowin camp, after the winds and snow had let up a bit. It looked different than when I had left on Monday. Half the tents remained and a few people bustled about in the bitter cold, still winterizing structures. Others were looking for rides home. Protesters sprawl out in the pavilion of the Prairie Nights casino to take shelter from the frigid winter conditions outside. Tay Wiles is an associate editor of High Country News. She can be reached at [email protected].